Plenary convocation (in English, French and Polish). Latest update and Greetings here. Plenary convocation (in English, French and Polish) and report (French). Latest update and Greetings (in English, French and Polish). Plenary convocation (in English, French and Polish) here. Our General Assembly Report here. Latest update and Plenary convocation (in English, French and Polish) here. Latest update and Greetings (in English, French and Polish) here. Our annual get-together took place last September. The report (in French and Polish) here. We are taking part in Villard-de-Lans to the "Variations polonaises en Vercors". The program (in French) here. Our annual get-together took place on the last weekend of August. 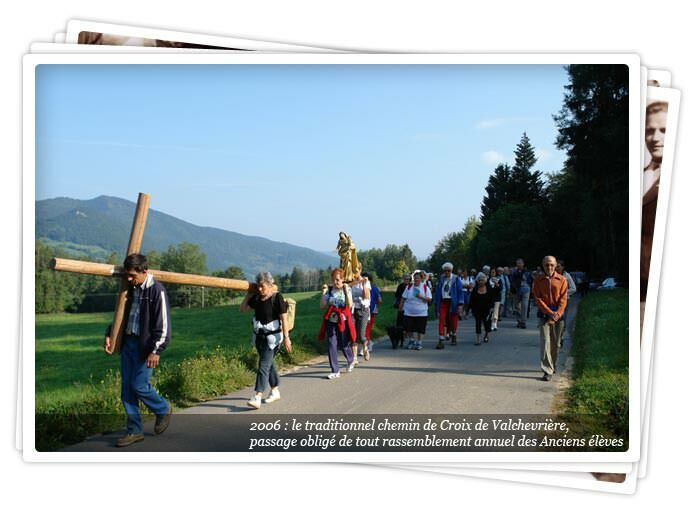 As usual, on the Saturday, a wreath was laid on the Poles’ Tomb in the Villard-de-Lans graveyard and the General Meeting was held, followed by mass, a cocktail reception and evening dinner; on the Sunday, we congregated at the 7th Station of the Valchevrière Way of the Cross. The General Meeting approved our current projects. Now we need to get the work done, which of course is the hardest part! Translation of the following works: Wolna Szkola Polska, by Tadeusz Lepkowski; Moj Villard-de-Lans, by Adam Skinder; Goscie Hotelu Du Parc, by Karo Obidniak and Jozef Wedrychowski; Villardczyk, by Henryk Grabowski. Some translations have been completed while others are under way. Still to do: page layout and publication. Digitalisation of Ewa Cendrowska’s film: Retour au Vercors (Back to the Vercors). Translation of this website into Polish and English. Digitalisation of our archives before donating them to the Isere Departmental Archives Service. In addition, all available photos have now been digitalised and are on display on this website (Photo Library section). Please contact us to request the necessary authorisation if you wish to download them for publishing purposes. Other project: repairs to the tomb for the Poles buried in the Villard-de-Lans graveyard. The Association’s next General Meeting will be held on 30 and 31 August in Villard-de-Lans. Finally, Ewa Valentin-Staczek’s book,”Villardczycy”, has been translated and privately printed under the title “Les Villardiens”, and is available through us. (565 pages. Contains more than 400 photos and reproductions of documents. Historical reminders and biographies of around 300 pupils and teachers). - Completion of the Polish High School’s website. Officially on-line at the beginning of February. Tadeuz Lepkowski: the historical “bible”. Carol Obidiniak and Joseph Wedrychowszi: a play telling about life at the school. Adam Skinder: a collection of anecdotes about the school. Ewa Valentin-Staczek: biography of some of the school’s pupils and teachers. Ewa and Yvonki Valentin: personal recollections of the Polish High School years.